Antiques experts Phil Serrell and James Braxton travel through north west England. Phil visits the birthplace of an iconic band, and James finds out the story of scouting. This week's venture pairs two auctioneers vying for Road Trip victory. James Braxton knows how to play tactically. Yeah, Philip will be weeping when he sees that. during his 30 years in the antiques business. Our two professionals began with £200 each. with over £100 separating them. Philip's eclectic assortment of goodies has bagged him £255.88 so far. as the chaps belt up for the latest leg. -Do you know what? I think I've got to change my plan. and it's turned around and bit me on my not insubstantial bum, really. You're always pushing the seams of the definition of an antique. But it can all change in the shake of a tail feather. in this splendid 1955 Austin-Healey. I'm just going to follow you, I think. I'm going to just watch what you buy and try and buy the same things. "Watch and learn," I think is the phrase. I wouldn't get too comfy up there on your pedestal, James. Lancashire, Cheshire, into Wales, before concluding in Newport, Shropshire. This is lovely, isn't it? Have you been to Southport before? Britain's last official chief hangman. but today, it will be James' and Philip's reputations hanging in the balance. There's a lot of very good housing stock in Knutsford. Maybe I'll buy sort of architectural fittings, door plates. Really? I think I've got to go and buy Royal Doulton and bits of silver. That's the way forward for me. Well, they'd better get started. First stop is in the heart of the town centre. -Whoa, whoa, whoa. There we are, look. so there should be plenty of choice. Well, I'm just Doulton and silver, Doulton and silver. Oh, look at this. I've got the distinct feeling like I'm giving my age away here. Hank Marvin. Do you remember Hank Marvin? -to try and dig out a juicy find. Hey, there's a bit of arts and crafts. the home of arts and crafts. But this time, the auction is in Knutsford. I should buy that. I need to get ahead. But Philip's also deviating from his plan. He's given up on Doulton and silver and true to form, he's heading off piste. leaving James the shop to himself. Let's see how my day is going to roll. But James has already spotted an old favourite of his. This is an interesting fellow. This is a flower brick. They're made of delft, which is a tin-glazed earthenware. This one's a ceramic one. What is it? Blue and white. Three pounds, and then it's got 50p here. It's a nice sort of 18th-century design. Original 18th-century tin-glazed flower bricks can make upwards of £500 at auction. This is a reproduction but they're still fairly unusual to see. so at 50p, this represents incredible value for money. Philip's off on one of his jaunts again. not necessarily the first place you'd think of going shopping. and may have some going spare. -Hi, Mark. How are you? that was surplus and you might want to sell it. but it's more usually rugby and fast cars. ..just like a leg of mutton. -But hasn't that got a lovely colour? Hey, you've got all the terminology, haven't you? Bit of leather work required but that's not major. -You would put the barrels down there. and there's some pegs here where there's been a divider. Early shooting stick for the gentleman perhaps who wanted to just take a rest in the field. There you are, isn't it? It's peaceful, isn't it? No time for sitting, Philip. And you've got this little bit here. Yeah, that unscrews, screws on the bottom. Stops it sinking into the mud. It stops you burying yourself in the field. I love that. That's really, really nice. Looks like Philip's cunning plan is working out nicely. Then got a little measure that could go with that. -that would go into a cartridge, isn't it? Mark has also got a rather large stash of fishing memorabilia. A little reel there, a little Hardy Princess. -Yeah, that's the name people want. with Hardys being one of the most collectable brands. -Isn't that just beautiful, look? -Three little flies in there. -Three little flies on there. Oh, that's fantastic, that is. And what's that? -That's Hardy, it's on the fins. that's if he can persuade restaurant owner Mark to part with them. -What do you want for it all? I'd like to give you 80 quid for it all, really. Then I'd have two lots. -This is what we call a pregnant pause in the trade. and three-part fishing lot for £30. but I think he's sold me a really good deal. I'm just hopeful that I can catch up with James. not exactly manager Caroline's deal of the century. I managed to find about the cheapest item I think is in the place, isn't it? -Yes, you're quite right there. 50p. -It's a king's ransom, isn't it? I'm not even going to haggle over 50p. I think it would be rather rude. -You want change? You want some change? -I'd love some change. Thank you. the home of The Beatles, the world's first supergroup. Well, revolutionary, they really, really were. They changed the face of music for my generation. that the Fab Four really began, as Paul McCartney fondly remembers. because they know about the Cavern. They know about some of those things but the Casbah was like the place where all that started. and we had a more intimate relationship with it. It was almost our club because, you know, we'd help paint it and stuff. of the early Beatles story way back in 1959. -Hi, Phil. Nice to meet you. Am I looking forward to this. Roag's mother, Mona, was an extraordinary woman. performing death-defying circus stunts like this. so she offered them the basement to use. -That was our mother's work. your club would ward away evil spirits and bring good fortune. It's a good luck charm. little rub on the way in. The Beatles touched this and it brought them good luck. I think it brought them a lot of luck, Phil. shown by the incredible story behind the house. My brother Rory saw the house, told Mo about it. The money from the jewellery, she went and bet everything on a horse in the 1954 Derby. ..took a real punt and stuffed it on a horse at 33 to 1? Downstairs, the Casbah Club soon became the place to hang out for local music. the budding musicians had to help decorate the basement. and certainly left his mark. -Yeah, carved his name into the wall. Mo wasn't happy. She called John at the tail end of doing that. He got a crack around the head. this is his artwork, he's signing his name. Mo's looking at it as he's vandalising her club. officially became The Beatles in 1960.
the band returned triumphant here to the Casbah Club. was on this stage on the 17th December 1960.
and they're playing in a cellar the size of a postage stamp. They kept jamming into the club and jamming into the club. of which 1,300 would stand in the garden just listening to them. but they left behind more than artwork and memories. one of Paul's earliest mics. Absolute history. I'm not going to try and sing. And another lovely little item I've got for you. This is John Lennon's penknife. He hadn't forgotten about being told off and getting a smack from Mo. and carve into the ceiling "John I'm back." No, it's over there, Phil. Over there. That's just fantastic, isn't it? This has been really magical for me. I think I'm probably the right age to come here. You've been a star. -Phil, it's been a pleasure. I've got to return you that before I put it in an auction. You take care. but her memory lives on in the perfectly preserved Casbah. James is heading north-east to Chorley in Lancashire. Sir Henry Tate was born in Chorley in 1819.
in the delightful market town set at the foot of the West Pennine Moors. the 16th-century grade I listed historic house. it's been home to an antique centre run by Dennis and Lynne Harrison. -Everything's a bargain, is it? Not a problem for James, though, with over £350 in his pocket. -Arts and crafts this is. It's a nice copper fellow. Arts and crafts mortise, and integrity of design again. and then a typical sort of stylised poppy decoration. but if they say to me, "That's £40," it's not worth the punt. is the epitome of arts and crafts. a common motif in the movement. and doesn't have a price tag on it. I think James might have a live one on his hands here. -You see, that makes it a marginal purchase for me. -I tell you what, meet you in the middle. £22. -£25. I will give you £25. -Very kind. Thank you very much. It's not often James can't charm his way to the price he wants. so they'd best get in some beauty sleep. Our experts are once more taking the open-topped Austin-Healey for a spin. Have you always been a cravat man, James? and the old army saying is "Any fool can be uncomfortable." And I come prepared. I've got my little rug round my knees. -It's like going out with Bertie Wooster. Doesn't that make you Jeeves, then, Philip? leaving him just over £175 to splash today. after picking up a copper fire curb and a flower brick for a song. It might be an early start but the boys are in high spirits this morning. but another of Wigan's most famous citizens was Margery Booth. Margery smuggled information out of a prisoner of war camp. while concealing secret documents in her underwear. who's at JW Antiques just outside Wigan, run by owner William Kenny. -Hi, nice to meet you, William. Very fine place you have here. I don't know. I can't find anything. but today, he seems to be, well, dithering. Anything else I should be looking at? Have you got anything tucked away? Finally, James has found himself reverting to type. Such good-quality thing, a nice wrought iron frame. Again, sort of very arts and crafts feel to it. Beautiful work here, and then a nice copper bowl. A coal bucket, so a fireside position. Good swing handle to it. Quite practical. After all that, James has gone for arts and crafts again. -And what about your walnut table here? -That's a good look, isn't it? -Yes. Only come in last week, that. James loves nothing more than a whiff of fresh stock. We've got a nice art deco, so 1920s piece of furniture. You don't see these so often. It's got strong lines and that could do quite well. -And how much on the jug there? Well, that looks good. So Glyn Colledge. Maker for Denby. It's a good shape, isn't it? Nice pot. £20. Somebody wants a sort of '60s interior, that's the fellow for them. It's a nice item. James has finally picked out three items. Now he just needs to make it worth his while. -And how much have you got on this fellow? My only hesitation with this is it's a replacement bowl. It's a good-quality replacement bowl but it's still a replacement bowl. -Could that be a bit cheaper, William? -What was the art deco table? -Did we say £55 on that? And then £20 on the pot on top of it. -You can have the three - one, two, three - £100. Goodness. I'm not going to argue with that. Thanks a lot, William. in the small village of Bretherton in Lancashire. but now the old corn mill has another use. This family-run business is headed up by Aiden Finn. It's an old favourite of Philip's so he's hoping to pick up a good deal. Old Phil, it's lovely to see you back again. -Are you looking for some more bargains? Well, I'm looking for something different. -Have you got anything put by for me? -I always have something for you. Oh, what's he got out the back, then? -Have you ever seen these? You can see here where you've got the different layers of timber. They've got all the stampings of the aviation stuff. made by British aircraft manufacturers Vickers or Handley Page. so he may be onto something here. but I know you want a bargain. That's £225 to you and me. But they're not going to make £200, I don't think. The most I can give you for these is 70 quid. That's me finished out of it. -I can give you 70 quid. -I hope you do well. -Thank you very, very much indeed. Thank you. I'd better give you some money quickly. £70 for two antique propellers sounds like an incredible deal to me. -You've done me proud again. See you soon. -See you later on. Cheers. Meanwhile, James is propelling north towards Preston. signalling a safe and enjoyable night on the town. Sadly for James, he's only here for the day. one of the UK's 361 Scout centres and camps. and its 30 million members. a Scout since he was nine years old. Thank you. Looks fabulous. Let's go in. how to gather information about an area or an enemy, called Aids To Scouting. so his idea that even at the lowest range, you should be trained. A chapter here - Quickness Of Eye. Eye and ear. It's using your senses, isn't it? Dodging the enemy. Tracking. And it was the size, as we see, like a pack of cards to fit in their tunic pockets. in this case for Scouting. Baden-Powell was posted to defend the South African township of Mafeking against the Boers. shown by young lads who had acted as lookouts and helped guard prisoners. Baden-Powell realised the previously untapped potential of young people. did it come from this period in South Africa? that he often said they were the first Boy Scouts. so he held a camp at Brownsea Island in Dorset. -the little red book that he wrote for the soldiers came out as Scouting For Boys. he adapted his military book Aids To Scouting into Scouting For Boys. but was soon published as a complete book. with groups popping up all over the globe. and been translated into over 80 languages. Scouts from around the world gathered to celebrate their leader. We've got a rather nice little cooker there. and all he said he needed was a new pair of braces. a caravan and this is his stove that he used. That's jolly nice. It shows you the power of masses, doesn't it? And why should James miss out on all the fun? Transformed. In fact, wearing this uniform, I feel like a boy again. so Michael is showing James how to get knotted. These are the knots that a Scout would have to learn. There's so much fun you can have with a piece of rope, isn't there? -You can. They've got some superb books on knotting. -I love a bit of knotting. One of the trickiest knots is the bowline. So, we do the loop like so. -You want the long line. -Long line off that, yeah. -This is the sort of rabbit, isn't it? Round the back. -These three against that one. And that makes your bowline. That is a thing of beauty, Michael, isn't it? It really is. So, Michael, would I pass a proficiency test? -You're definitely a natural at knotting. Michael, thank you very much indeed. That's a great honour. -It's been a pleasure having you. his last lot for auction so he's heading east to Darwen. shown by the cotton balls on Darwen's coat of arms. built at the end of the 1800s to celebrate Queen Victoria's Diamond Jubilee. They say you've got to speculate to accumulate. and if I'm going to catch Braxton up, the lot is going to go. Looks like it could be antiques shop owner Steven Hughes's lucky day. so this could be the perfect place for Phil. -I'm very well. How are you? I tell you what, I love a man with belt and braces. We've got the same taste, have we? This is fantastic, this is. I've now lost at two auctions so I've got to try and catch him up. -We'll do our best to help you out. -I'd like a big lump. -Fits in with me, that. and Philip's already spotted two big lumps. Those are off a fireplace and they've been painted, haven't they? -And how much would those two be? Do you know, I'm warming to you. -I don't particularly want to lift them. of a pile of stonework. -I think they've got some potential. 60 quid the two. Provided I don't have to pick them up. but there's still plenty more to see inside Steven's huge warehouse. Hold on a minute. Hold on a minute. Hold on. That's n...nice. That's out of a library. but because there's no drawer sides, it's useless. -How much is that, please? -I'd like £150 for it. and those two pillars outside. Now, I know straightaway from what you're asking. We're asking what? £150 and £75. -£225,and you're offering me £105. -That's like 50-odd percent off. -But you're well behind on the...? -I'm £100 behind at the minute. Phil will have the violins out in a minute. I'll do the deal as long as I don't have to pick the stones up. Steven, you're a star. Thank you ever so much. Jammy so-and-so. 50% discount is a massive drop. not forgetting the 88 pence, Philip's now completely spent up. With the shopping complete, let's remind ourselves what they've got. making five lots all ready for auction. barely a third of his budget. But what do they make of each other's wares? Phil's bought some really good items. I love his propellers. and I think he could take me on this one. but 50 pence for a three-week-old flower brick? What's going on? but he can afford to, he's £100 more in front of me. Me, I've had to spend every penny. I could be really in the doo-doos here. ending up at auction in Knutsford, Cheshire. How much were you ahead of me before we started? -Philip, let's just leave it at over £100. Shall I just say it again? Over £100. I wouldn't get too cocky, James. You never can tell what will happen at the auction. who can commute to the nearby cities of Manchester and Liverpool. It is wealthy around here. You can smell it, can't you? what I really want is a footballer who's got a penchant for propellers. Frank Marshall are local surveyors, estate agents and auctioneers. -I think we're here, Philip. Safe and sound. Never in any doubt. and she's already eyed up the fellas' wares. The library drawers, really popular at the moment. The propellers are rather interesting. The fender's rather nice and you've got an arts and crafts coal bucket as well. so they should hopefully do really well on the day. The boys' fate is in the hands of the good folk of Knutsford. -I think I might be a bit doomed here, mate. -No telephone booths, no online bidding. It's too late now, fellas. On with the auction. First up is James's Denby jug. Who's going to start me at £20? £20. Surely it's worth £20. £15, then, if it helps. This is just music to my ears. I mean, sorry, this is really sad. £10. Thank you sir. £10 on the front row. -At £15, are we all finished and done at £15? I think you'll find that's brought it back to 96 quid. I think Philip may be enjoying this. Not a great start for James with a £5 loss. -That was a weak lot. -Things are looking up, aren't they? Don't speak too soon, Philip. Next it's James's pricy flower brick. Nice decorative item at £5 now. £5. Surely. Come on. £5, someone. Thank you, madam. Right at the back. It's with the lady at £5. That's all right. Very happy with that. It would be, it's a remarkable 900% profit. Sadly, that only means £4.50 in the kitty. -Have I got any chance of profit? -Well, you've sold two lots as well. That's the best thing for me. You've only got three to come. I've still got five to go. Mind you, that could be five disasters, couldn't it? to take the bait for Philip's fishing lot. £55. £60. £65. £70. £75. No, he shakes his head. It's at £100. Are we all finished and done at £100? On my left at £100. Oh, that's jolly good. Well done, you. but he did buy it from a restaurant. I'm having a celebration sweetie, Jim. Doesn't say much, does he? Yes, James has gone remarkably quiet now the tables have turned. Next up is his fire curb. Start me at £20 with the fender. £20. £10, then. £10. £10 on my left. £12. £15. £18. The gentleman now at £18. Whoops! That's a second loss for James. "It's all about buying what the sale room wants,"? Now, now, Philip, play nicely. Let's see if James's coal bucket can fire things back up for him. Nice coal bucket. £20. Come on. £20 I have. £20. £22 with you. I'll come back to you. £25. £28. No. £38, sir? No, it's a £35. -That's cheaper than that, James. Ouch. It turns out arts and crafts aren't popular in Knutsford. but that's another loss after auction costs. -Next it's Philip's shooting lot. -I like the cartridge bag. I think it will make £85. -Start me at £30 to start. £30. £30, I have at £30. £40. £42. £45. £48. £50. £55. £60. £65. That's outrageous, Philip. Well done, you. Now you're just going to ratify your position with your propellers. It's just like being gently trampled into the ground, isn't it? for the last two auctions, doubling his money again. Maybe rubbing that dragon in the Casbah helped after all. Will his luck hold with his propellers up next? Lots of interest, as you can imagine. Rather interesting lot. -And I must start the bidding with me at £60. It's a commission bid now of £60. £65. £70. Phew, that could have been a lot worse. It's still a £50 profit. -I thought that was going to career away. Now it's over to James's final lot, his art deco walnut table. with a commission bid of £55. Still with the commission bidder at £55. Are we all finished and done at £55? That's a £10 profit for James. that auctioneer Rachel has tipped for success. Sorry, sorry, I've lost all interest in this particular auction. Me, me, me, me, me. No interest in his partner. -Got lots of interest so I must start the bidding at £50. They just can't stop bidding with you. It's at £100 standing now. Fresh bidder. £110. £120. £130. £140. Certainly looks like it as Philip has more than doubled his money again. That's been your biggest earner so far. It is but I've had some luck at where I've shopped. The luck is to where you shop. Yeah, but not everybody would have bought that in a shop. And Philip's still got his final lot, the stone pillars. I have interest on the book and I have to start the bidding with a bid of £40. Commission bid now at £40. £45. This isn't the lot, is it? Come on, James, get with it. Didn't see that sort of rhythm on any of my lots, I must say. -It's about a 50 quid profit there, Jim. -Just steady work, isn't it? -Very good. You've had a great day. I've had a great day. I've had my best day. I bear you no grudges and I must say, I feel very pleased for you, Philip. You know, for one minute, I thought you meant that. Get out of here. I'm certainly not shaking your hand. James began today with £356.04. giving him £335.50 to spend next time. with £255.88 to start with. giving him £463.30 to spend on the fourth leg. You ought to drive, Jim. With all that money swirling around in my head, I won't be able to concentrate. I must say, talk about a one-sided auction. A bit of a suggestion to make for you. I think the time has now come to steer clear of arts and crafts. I think so. I think you're right. I'm just going to sit here and bask in the sun and the profits. Next time on Antiques Road Trip, the pressure mounts. It doesn't get any easier, that. And James will do anything to get ahead. It's all right. I do yoga so I've got a good balance. 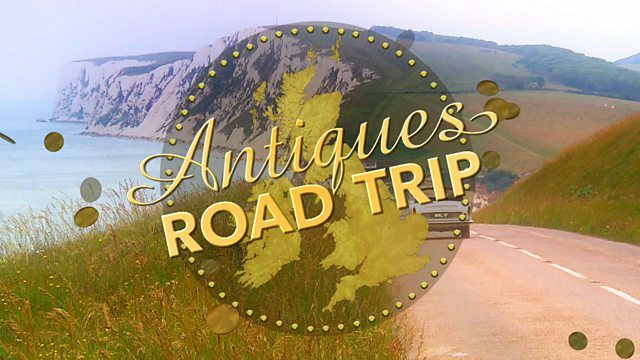 Antiques experts Phil Serrell and James Braxton travel through north west England on the third leg of their road trip. Phil visits the birthplace of the world's most iconic band in Liverpool, and James relives his childhood as he finds out the story of scouting.